Personal Lea: New! Teacher Wish Lists! A special thank you to teacher Elizabeth Reynolds who gave us a stellar idea today at the Saints Fall Bazaar - a teacher wish list! Duh, why didn't we think of this before, since we always are looking out for great teacher gifts! Well, it's not too late for this year - we have some printed off and will keep them up at the cash register at the bazaar tomorrow - then we'll hang on to them until the teachers get what they want!!! So we need YOU, are awesome customers, to get your teacher to fill one out so that parents can swing by and get their special teacher exactly what he or she would like! 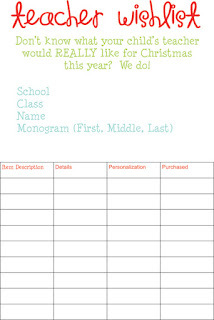 Kind of like a gift registry, but we will also have their name and monogram spellings on file to make it super easy! What to get for that teacher who has everything!